Lessons learned from my first triathlon that applies to lean and business. Originally I was going to call this piece “Talent vs. Persistence” meaning you can have talent (in this case athletic ability) or persistence. I don’t possess the required athletic ability to be a competitive racer; but I can be persistent. In this situation persistence paid off for me. Sometimes in our business life we don’t have the requisite talents that are needed to get the job done; persistence can be our ally. I knew I wasn’t trying to set any records, but I did have two goals in mind. Since this was my first triathlon, I had two goals: 1) to finish, and, 2) cause no harm to other participants (I didn’t want to get in their way, cause a pile up on the bikes, etc.). Setting goals in business seems common place, but many organizations can’t even tell you what their top goals are for the year; let alone their strategic initiatives. Short-term goals during my workouts included deciding how far to swim, bike or run. I also set some stretch goals of going farther than I have before (I called them PBs for Personal Best). Just getting to the gym some days exceeded my expectation. One of the things that really helped me keep moving forward is when both spectators and volunteers along the route would say things like “great job” or “keep going.” These people didn’t know me, but they encouraged me anyway. How many times in business do we hear people say “you can’t do that” or “this can’t be done”? You don’t get much support from people who actually know you. What would it be like if your coworkers said things that gave you inspiration instead of things that damper your spirit? As you approach the finish line you crossover a sensor that reads your chip that tracks your time and information and the announcer broadcasts your name and hometown. They also take your photo and give you a medal; great acknowledgement of your accomplishment! For a personal reward, we went out for dinner to our favorite deep dish pizza place Lou Malnati’s for a spectacular meal that was a real treat (next time you’re in Chicago you have to go to Lou’s). P.S. 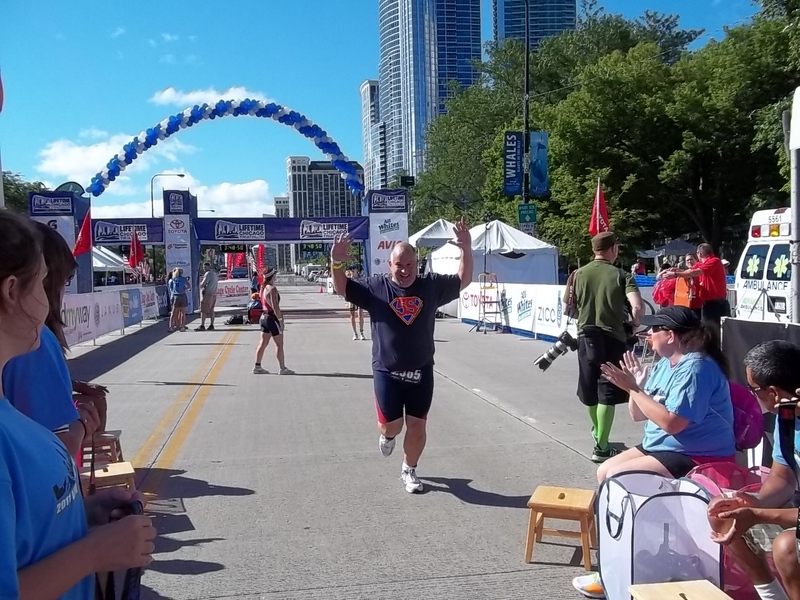 If you ever consider doing a triathlon, I would highly recommend the Chicago Triathlon which is the world’s largest with over 8,000 participants. The organizers and volunteers do an incredible job from start to finish. Interestingly, Toyota is one of the event sponsors (what a coincidence with “lean” or TPS). Your story reminded me that several years ago, a week before my daughter’s wedding, I ran in a 5K to gain a little more perspective on my future son-in-law, who was a runner in high school (Ohio state champion in Cross Country and 1 mile run) and college. I used my experience from my run to give them perspective on what marriage is like during my toast at their reception.